Pablo & Ian at last FP session in BA, the guys did another test vs the F20, not published as I wasn´t there, but I saw the GoPro footage. I can only tell you what a pity not having a match at Texel, as is clear nobody knows the actual settings on the new production foilers (FP & F20) , not even close the builders themselves! And we are discovering lots of interesting stuff.. some rather shocking indeed, but we will continue to test to have a good stablished pattern. Also had a chat with Martin Fischer on the last outcomings on this test and he agreed on the logic for the changes made in settings & handling to be on the right path for the FP. Press release sent below by Phantom Int on their series at Geneva. ub de Genève and the Geneva-Rolle-Geneva. These 3 days of the Flying Phantom Series Geneva 2015 will provide the perfect mix for the participants with 2 days of One Design racing and a long distance race. A year ago the Flying Phantom sailed for the first time on Lake Geneva competing in the Geneva Rolle Geneva and round Lake Geneva. 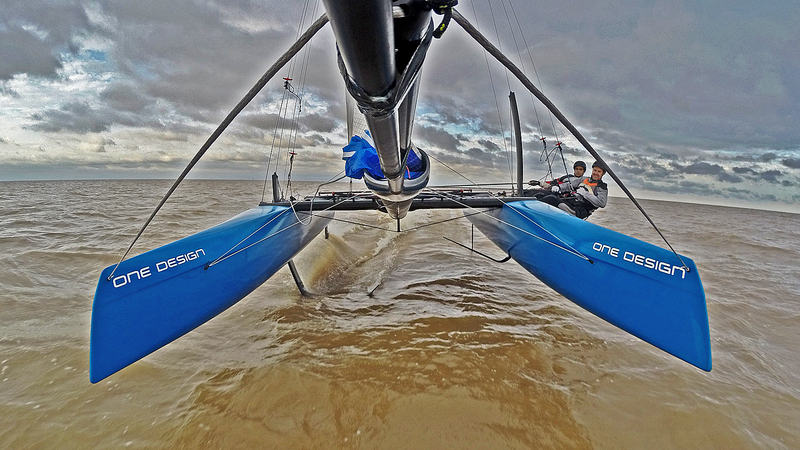 Following the same race course and starting line as the other boats competing in the Bol d’Or Mirabaud, they achieved an unofficial time of 6 hours and 21 minutes. Yacht Club de Genève, the races will take place in front of the Yacht Club at “La Tour Carrée” in Cologny. Depending on the weather conditions, the courses will be laid out to offer a reaching start with a clearing mark in the middle, a leeward gate, a windward gate and a reaching finish after rounding the clearing buoy. Around 8 Flying Phantoms are planning to take part in this event, with Team Tilt Sailing - SUI, Team Momentys - FRA, Team Neuhann – GER, Phantom Sailing Team – FRA among them. In addition to these events, the Flying Phantom fleet will also compete at the Société Nautique de Genève Tuesday regatta on the 9th and during the week training sessions will be arranged with Flying Phantom customers, as well as introductory sessions to enable people to discover these boats".